Dr. Jagannathan received his medical degree from the University of Illinois College of Medicine in Peoria, Illinois in May 2002. He completed his Transitional Internship at St. Luke’s Medical Center in Milwaukee in June 2003 and his Diagnostic Radiology Residency at St. Luke’s Medical Center in Milwaukee in June 2007. He went on to complete a fellowship in Vascular Interventional Radiology at Massachusetts General Hospital in Boston, MA in June 2008. Dr. Jagannathan is a member of the Radiology Society of North America, Society of Interventional Radiology and the American College of Radiology. 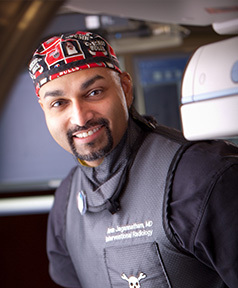 Dr. Jagannathan joined Central Illinois Radiological Associates in July 2008.